President David Granger Tuesday night- Emancipation Eve- urged Guyanese to become educated to take advantage of the country’s emerging oil wealth as the route towards economic emancipation. In what appeared to be his frankest public address yet to the Afro-Guyanese community, he called on them to cease idling and depending on others for monies, but use their talent to create jobs, enrich themselves and ensure food self-sufficiency. “Go out there and use your talent to enrich yourself and your children. That is economic emancipation. We must go out there and use our talents. If we make our living by hanging around the corner and liming at the Guinness Bar, we will be forever poor but if we go into our farm, go into our workshop, go into our schools we will be able to bring prosperity,” he said. The President said it was not time to reflect on the past but to focus on the next 10 to 18 years when “that mighty Atlantic starts to generate wealth for Guyana” Granger promised to ensure that oil revenues benefit all Guyanese in a fair manner, but said it was up to them to gear up to be hired in the petroleum sector. “I can do everything possible to make sure that the profits and benefits are equitably shared but you and your children, your sons and daughters must be educated and must be empowered to make use of that new talent,” he said. “This is a chance of a lifetime and you, who are living today, are witnessing the most transformative event in Guyana’s economic history- the coming of the petroleum industry. Don’t be sidelined, don’t be left behind. Go to school, educate yourself so you can do for your grandchildren and future generations what your fore-parents did for you,” he added. 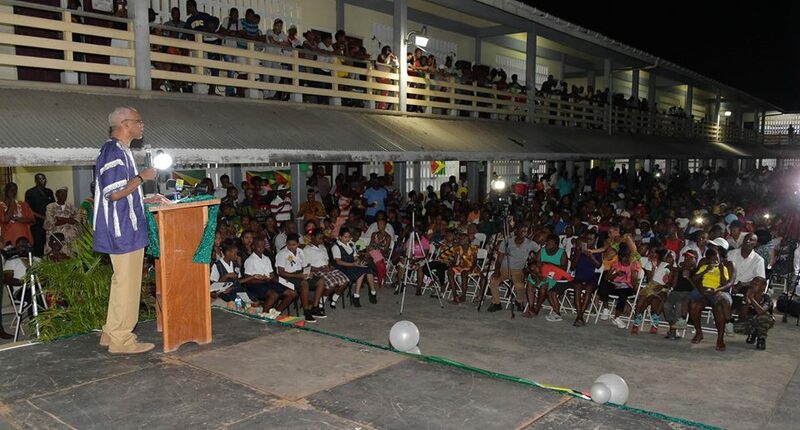 Addressing residents at Beterverwagting village, East Coast Demerara to usher in the 180th anniversary of the abolition of slavery, the Guyanese leader told the gathering that the petroleum reserves belong to Guyanese. “There is out there in the Atlantic a powerful resource that belongs to all of us. It is not for foreigners, it is not for strangers, it’s not for outsiders. It’s for you, your children and generations to come and we in Guyana have to prepare ourselves for that economic emancipation,” said the President. While stressing the importance of the oil sector in propelling Guyana’s development, he also highlighted the need for villagers across the country to become self-employed in the areas of agriculture, food processing and manufacturing to become self-sufficient in food. “You must be ashamed if you do not have work. Some people are proud that they don’t have work. They want a raise. They always want a raise. People get a raise today, they expect to come back to come back to want another raise but we’ll have to promote self-employment in this village and other villages,” Granger said, adding that government services could not employ an unlimited number of persons. The President said instead of hanging out at drinking spots and owning cellular phones and fancy clothing although they were unemployed, they should become educated and generate their own jobs to develop the village economies. He admitted that his message was hard-hitting but necessary. “So my brothers and sisters, tonight you’ve heard some hard words but emancipation was a tough thing. It was a hard thing for our ancestors,” he said. The President appealed to the residents of Beterverwagting to ease up on alcohol consumption and ensure their children attend schools. “Let’s put our monies in boats, buses and bicycles, not in vodka, rum and gin. Let’s put the children first. If our fore-parents were drunkards, we won’t be here today but they saved their money and they bought these villages not for themselves but for future generations,” he said. Specifically referring to Beterverwagting, he promised to fund a project to write the history of that village if anyone was interested in doing so. He noted that Beterverwagting was one of the “big six” villages: Buxton, Bagotville, Victoria, Plaisance, Queenstown on the Essequibo Coast.